The above photo of West Market Street United Methodist Church shows the beauty of the historic structure as well as the people who bring the church to life. The church, founded in 1830, has been open on the present site since 1898. Over the years, the church has added considerable square footage. If you look at the right-hand side of the building, near the red truck, you will see one of the main entrances as well as the façade of the new part of the church. Additionally, they have built a child care center across the street. The chronology of the church is available online, here. Emerson Spivey, and local historian, Gayle Fripp, maintain the historical archives for the church. How wonderful that the church is doing such a fine job of maintaining their archives. From a childcare center to youth groups to Sunday sermons to Bible studies to adult groups, West Market Street United Methodist Church has something for everybody- from cradle to grave. As the Thanksgiving week draws to a close, many Greensboro residents will be gearing up for Christmas, including the members of West Market Street UMC. Happy Sunday! The quilt exhibit of fiber artist Gwendolyn Magee has come and gone from the Gatewood Gallery on UNCG's campus. The above photo captures the essence of her solo exhibit entitled, "Lift Every Voice and Sing." It was her first exhibit in North Carolina and, unfortunately, it was posthumously. The intricately detailed quilts capture the continuum of the good to the bad in the life of African Americans over the last several decades. From the beauty of a college graduation ceremony to the horrors of lynchings, complete with a list of names by state, much of Magee's work is an emotional experience. Originally from High Point, Magee lived in Mississippi from 1972 until her death in 2011. She learned to quilt in 1989 to give her daughters a gift to take to college, as a touch of home and a tangible reminder of their mother's love. * Quickly, Magee's quilting evolved from college bedspreads to works of art of historical significance. With all of the important civil rights events in Guilford County, we'd like to think that even though Gwendolyn Magee lived in Mississippi, some of her artistic inspiration came from her childhood here. *Reference and read more of Magee's story, here. If you are out and about on Black Friday, stroll past the Children's Museum and check out the cow on the roof. It is part of the Cow Parade art event staged in 79 cities. The above cow, called Night-N-Day, was designed by Helen Seebold. * We love the cow and the name of the artist Seebold. Not only does she "see" "bold" but she paints "bold." Indeed, the complimentary colors, Howard Johnson orange and blue, make the contrast as evident as night and day. There is a lot going on at the Children's Museum next week. First Friday is December 5th and the 5-8pm admission is only $2 per person. Then, December 6th is Polar Express Day. Many children get their picture taken with Santa, wearing their PJ's. It is such a fun place to bring out the inner child in all of us. Photographing that cow, trying to fit the word "Greensboro" into the frame was fun. Have a great Black Friday, and create some traditions, even if they don't involve shopping! * reference and more information in this News & Record article, here. This 12 ft. tall steel sculpture, entitled Metaphor by Ogden Deal, has been reaching to the sky in downtown Greensboro since 1970. Installed at Greensboro Youth Plaza, it was a project co-coordinated by Greensboro Youth Council. To orient yourself to the view, you can see the northern end of Elm Street in the background. The JP Building is peeking out from behind the Greensboro Historical Museum at the left. The sculpture is easy to overlook, especially when trees are leafed out. However, once you notice it, you wonder how you ever overlooked something twelve feet tall. Deal also made the Edward Murrow bust, installed within view of Metaphor. The above statue stretches to the sky as if to be expressing gratitude, reminding us that today is a day to give thanks. Thank you Greensboro for being such a great city to call home and for giving us so much to photograph throughout the year. In preparing this post, we uncovered an inventory of Greensboro's public art, complete with name of the piece, artist, location of installation, address, commissioner of the art, description, and type of art. Here is an action plan for Greensboro's public art program. Family, friends, public art, and a great place to call home, indeed, make us thankful. Happy Thanksgiving, dear readers. Jim Melvin was instrumental in getting the baseball park built in downtown Greensboro, back in a time when many locals were hoping to hold on to War Memorial Stadium. Melvin, the longest serving mayor in Greensboro's history (1971-1981), among other ventures, has been a banker, and is currently President and CEO of the Bryan Foundation. The statue was commissioned and installed at NewBridge Bank Park in recognition of a lifetime of service to Greensboro. The statue was presented earlier this year, at the occassion of Mr. Melvin's 80th birthday. *It is always nice to be appreciated, yet, knowing Mr. Melvin, would continue to work tirelessly for the good of Greensboro, statue or no statue. On a day the stadium is open, we will capture a photo from the front; however, in a way, it is nice to capture Mr. Melvin looking out over the ballpark. We had the good fortune of interviewing Mr. Melvin back in 2011 and featured him, here. In the spirit of Thanksgiving, we are thankful for citizens committed to civic duty, regardless of where they live. The above photo is of an abandoned home, located at the corner of Old Oak Ridge and Union Grove Roads. Currently, it is for sale, intended to be knocked down to make way for new construction; unless, of course, someone wants to spend a great deal of money returning it to a better state. The property is characteristic of rural, North Carolina homes. It has a fireplace, extends in many directions, has a large lot and splendid, giant oak trees. It is also typical of old homes surrounded by urban sprawl. What was once a country house quickly becomes a business opportunity. It will be interesting to see the future of this old home. 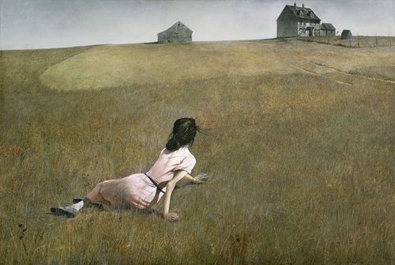 In a way, the view reminds us of Andrew Wyeth's painting, Christina's Home. Driving around the western end of Guilford County, we realized that Old Oak Ridge Road actually becomes North Main Street in Kernersville. Taking the back roads to Kernersville is a good way to see the old merging with the new. Today starts a new week and we hope it is a good one for you. If you don't have plans for Thanksgiving, it is never too late to find a community organization that could use your company and help. Try to find some time to ride around Guilford County and uncover glorious views like the one above. Winterfest 2014 has begun. Yesterday was opening day of Greensboro's pop-up ice rink, which has relocated to Barnhardt Street, just south of the railroad tracks at South Elm Street. The opening coincided with the last City Market of the season. A passle of Chick-fil-A cows and the WFMY News 2 crew were on hand to kick off the event. Weather reporter Grant Gilmore and anchor Julie Luck, with their heartfelt smiles and enthusiastic words, helped put the crowd in a festive mood. Greensboro is so lucky to have such great, family-oriented events. If you are looking for something to do this weekend, head down to the rink to skate and sled. Also, the Piedmont Interfaith Council (PIC) is holding their 32nd Ecumenical Thanksgiving Celebration this Sunday at 4pm at Dana Auditorium on the Guilford College Campus. Canned food donations are being collected. While Grant and Julie might not be there, you will definitely feel connect to the community and the holidays is you attend the PIC event. All faith groups are invited. Happy Friday! This weekend, the Colfax Persimmon Festival was held and the weather was perfect; sunny and cold, just the way persimmons like it. The festival was started in 2008 by Gene Stafford and is held on part of the land that comprised the Stafford family farm. The Revolutionary War-era farm is the perfect setting for the event which pays tribute to a simpler way of life. While there are a few games, some people dressed in period costumes, and military reenactors, people really came to enjoy the persimmons. Persimmons are an orange, edible fruit that tastes good in baked goods, especially persimmon bread and persimmon pudding. The native variety of persimmon has lots of seeds and is very labor intensive to extract the pulp. Pulp was available for purchase at the festival. The larger, Asian non-astringent variety is easier to eat and to use. However, nothing beats an old-timey 'simmon puddin' to go with Thanksgiving dinner. People came from great distances to celebrate persimmons this past Saturday. If you missed the event, mark your calendars for Saturday, November 7th 2015. Today, we're featuring the back side of Grace United Methodist Church. The photo was taken from the church parking lot in front of the baseball stadium at Eugene Street. The location of the parking lot has proven to be lucrative real estate for the church. The fees they collect for parking cars during baseball games supports local ministries. The church refers to it as "parking with a purpose." Grace Church dates back to 1891 at its original location on Lee Street and in this present location (438 West Friendly Avenue at Edgeworth) since 1926. It is a beautiful church with quite an interesting history. Perhaps the most famous person with connections to the church is Charlton Heston. He was married there while stationed in Greensboro during World War II. * As we enter this "cold spell," those beautiful leaves help us remember how special it is to have four distinct seasons. Happy, glorious, November Sunday. *read more about the history of the church, here. Yesterday, the Weatherspoon Art Museum celebrated the 150th birthday of Claribel Cone with a mini birthday party. Elaine Gustafson, Curator of Collections, spoke about the art collection bequest to the Weatherspoon by the Cones. Claribel and younger sister Etta had quite an art collection and many of these pieces are now owned by the Weatherspoon. The Weatherspoon, located at the corner of Spring Garden and Tate Streets on UNCG's campus, holds many open-to-the-public events like yesterday's birthday party. Great fun was had by all that attended. Thank you, Weatherspoon and staff. And, above all, thank you philanthropists like the Cone sisters who do things for reasons greater than themselves. We didn't get the name of the actress, featured in the above photo, but want to thank her now as she was masterful at staying in character. Today is Weekend Reflections Day and that floor, so shiny you can see your reflection in it, qualifies us to participate in the meme. On Veterans Day 2014, Major General H. Lloyd Wilkerson, USMC, spoke at the Veterans Day event at Friendly Center. Major General Wilkerson, born in Tennessee on Halloween in 1919, gave a poignant and articulate speech about the meaning of Veterans Day. The speech was of sufficient length to give a meaningful definition, yet short enough to keep the interest of the small crowd. Maj. Gen. Wilkerson, who served in World War II, Korea, and Vietnam, reminded us that "soldiers march to the beat of a gun serving a cause greater than themselves." Hopefully, someone got his fine speech on tape. If you missed the Veterans Day event this year, mark your calendar for next November 11th. The Marine Corps holds this event every year, promptly at 8:00 am at the flagpole in Friendly Center. While the crowd is usually small, it is always intergenerational. How nice seeing people of all ages together and showing true appreciation for each other. One mom told her son, upon meeting Maj. Gen. Wilkerson, "this may be the only time you ever get to meet a major general." The Major General mentioned that his son achieved that rank, and the young boy smiled.... a great morning for Greensboro. The above photo was taken on the front lawn of the student union at the University of North Carolina at Greensboro. While Veterans Day is intended to recognized all who have served, not just those who were killed, the above Field of Honor recognizes the deceased. The flags, placed by a veterans' organization at UNCG, represent the service men and women who were killed, died, or presumed dead as a prisoner of war during Operation Iraqui Freedom and Operation Enduring Freedom (Afghanistan). Yes, there are plenty of university students who first served the nation and are now studying for their future careers. Happy Veterans Day, to all who served, in Greensboro and beyond. It is nice to celebrate Veterans Day on the actual day of the holiday, November 11th. Unfortunately, the University is in session; however, the public schools are closed. If you have a chance today, thank a vet. Oakland Daily Photo, a City Daily Photo blog, started a meme called Monday Mural. People from all over the world share a picture of a mural in their community. One is shared every Monday from Oakland (California). Over the last few years, several murals have been appearing around town so it is high time we share one! Part of this recent colorization of Greensboro is thanks to the Greensboro Mural Project (GMP) an organization founded in 2011. GMP just held a fundraiser at Westerwood Tavern this weekend. Unfortunately, the event has come and gone; however, if you want to get involved in this project in some way, such as helping paint or making a financial donation, you can find GMP through their Facebook page. The above mural is one of their works in progress at the corner of West Friendly Avenue and Mendenhall Street, a block away from Greensboro College. Next time you drive by, have a look. Also, stop by Monday Mural, where we're sharing this photo with the world! We can't imagine finding a mural a week around Greensboro. However, we said the same about religious institutions and in nearly 6 years of posting something religious on Sunday, we are nowhere near running out of places to photograph. Maybe, if we start looking, it will be true with murals. What is your favorite mural in Greensboro? Today is shaping up to be a glorious day in Greensboro. Many residents of our community will be in a place of worship. From Zen Meditation at Scuppernong Books to Hillcrest Baptist Church (featured above) and everything in between, there is a spiritual community for everyone in Greensboro. Hillcrest Baptist is located on Pisgah Church Road, just before it crosses North Elm Street and becomes Lee's Chapel Road- 3920 Baylor Street is the actual address. The church has simple, but lovely stained glass windows and a traditional, white steeple at the front. Without finding a page online, we don't know when the church was constructed. However, to be sure, it was build back when Pisgah Church Road had a sleepy, country feel to it. Now, the surrounding area is a heavily-traveled transition from Greensboro, "the city" with Greensboro, "the suburbs." Somehow, we're betting that upon entering the sanctuary at Hillcrest, one experiences a respite from the hustle and bustle of daily living. Have a restful Sunday. In Greensboro the November full moon was fabulous this week. The skies were clear and the moon hovered in the Western sky until daybreak. This week's display more than made up for the supermoon and other moon events that got clouded over this year. In the centuries before artificial lighting made it possible to have light 24 hours a day, there was a time when a bright moon made travel possible through the night. November's full moon is also known as the beaver moon. This week it was so bright that it made the meteor shower hard to view. It is easy to see why North Carolina's old-time fiddle tunes refer to dancing "by the light of the moon." Locally, it was bright this week. Near twilight, prime time for seeing meteriods, we kept running out to check and never did see any. We did, however, have this beautiful moon greeting us. We sure hope you had a chance to see it. This vintage vehicle cruising down Bryan Boulevard last week was captured on a low-resolution, cell phone camera. The nostalgic feel of the photo evokes memories of yesteryear, a time when life (and vehicles) were less complicated. Can't you just imagine Andy and Barney driving from Surry County to Raleigh in a vehicle like this? How fun it would be, riding along with them. Surely, Andy Griffith would have some diplomatic, words of wisdom about election results- regardless of whether or not his candidates won. Likely, the well-meaning Barney Fife would put his foot in his mouth a few times and Andy would get him back on the right path. Even if you work this weekend, we hope you have a chance to slow down and appreciate the simpler things in life. From the colors of fall to meaningful conversations with loved ones, seemingly mundane aspects of life can turn out to be the most meaningful. It is good to be mindful of that when you are traveling the same highway for the tenth time in a week, which, for us, would be Bryan Boulevard. Happy weekend, dear readers! Other than in the print media, the above hand-lettered sign was our first sighting of the word "Ebola" in Greensboro. How strange to see "EBOLA CALL 911" on a Mercedes Benz at the Goodwill Store on West Market Street. What on earth was the message the driver of this car was trying to convey? The words "Goodwill Ebola" or "Ebola Goodwill" just don't seem to go together. *read more about here here. November is the month of giving thanks. Social media is loaded with people who express thanks, daily, from now until Thanksgiving. In Greensboro, fall is an especially beautiful time of the year and we have had some beautiful days this past October. The above photo was taken yesterday from leaves gathered near Bur-Mil Park and placed on a weathered bench. While the iPhone camera exaggerages colors (the bottom leaf was not quite that pink), this is an actual assortment of leaves found in a Greensboro yard. It is hard to top the beauty of nature. If there are any small children in your life, take them out on a nature hike and have everyone collect items to take back home to inspect. You can identify trees by their leaves, learn how long it takes a tree to start producing acorns, make leaf rubbings with paper and crayons, and so much more. If there aren't small children in your life, treat yourself to a nature hike. The out of doors is a great place to find reasons to give thanks. We give thanks for your starting your week reading Greensboro Daily Photo. Happy Monday, dear readers! Yesterday and today, at the Cultural Arts Center on Davie Street, Casa Azul of Greensboro is featuring a fabulous Day of the Dead exhibit. Casa Azul promotes Latin American art and culture in Greensboro through projects, partnerships and fabulous displays like the one featured above. The above altar is about 1/8 of the whole exhibit. We featured this display because it shows so many elements of the holiday: A cross for Christianity, a picture of the deceased loved one, flowers, the loved one's favorite foods, candles, papel picado, and skulls. The Day of the Dead is a Mexican holiday in which families celebrate the lives of their loved ones who are no longer on earth. While it is always sad for loved ones to be deceased, the Day of Dead is a time to remember them fondly by building an altar and visiting their graves. Casa Azul does so much to promote Latin American art and culture and to educate the local community about our neighbors from Mexico to Argentina and Peru and everywhere in between. Stop down today from 11:00 am-3:00pm to see their fabulous exhibit. In case you don't, we're featuring some more photos below. Finally, you can also see the animated movie "The Book of Life" (currently in theatres) if you are interested in the topic. With all of the political advertising, bumper stickers, buttons and commercials about the upcoming election on November 4th, it was refreshing to see campaigning of another kind- for eating healthy food. The above apron, worn by a very hardworking Earthfare supermarket employee, shows many of the buttons she has earned for doing good deeds at work. She earned one in our book by being so pleasant as we were checking out. It has been said that people who come door to door canvasing neighborhoods at electiontime document whether you are flying an American flag; they input what your bumper stickers on your car say; and they record names on signs in your yard. Well, if they came by Ms. Kathryn's house, they'd have to note, "eats healthy." Surely, that doesn't peg one as libreal or conservative; Democrat or Republican! Happy Saturday, folks. Don't forget to set the clock back an hour. Also, if you have enough energy left post-Halloween, head down to the Cultural Arts Center on Davie Street this evening or tomorrow for the Day of the Dead festivities- Greensboro style.